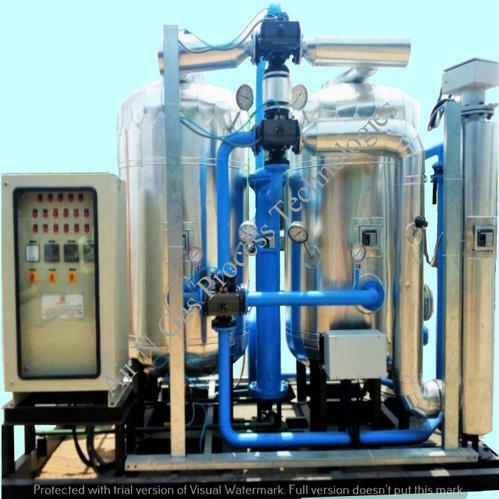 We are the most established and reputed manufacturer and supplier of Split Flow No Purge Loss Air Dryer. In Split Flow No Purge Loss Air Dryer incoming wet air is divided in a distributor.This is primarily used to save on purge loss, here part of wet air is circulated through a heater thereby increasing its moisture carrying capacity. 60-70% of wet air goes for drying while 30-40% of wet air is circulated through a heater. This air is sent back to the distributor where it mixed with incoming air and distributed again. No used of external air thus eliminating risk of contamination. We 'Air- N- Gas Process Technologies' established in the year 2007 are one of the prominent manufacturers, suppliers, traders and exporters of a wide range of PSA Nitrogen Generators, PSA Oxygen Generators, PSA Nitrogen Plants and Ammonia Cracking Units. We also provide installation and commissioning services. Our range is appreciated for fully automatic operation, easy installation and maintenance, zero purge loss, environment friendly operation and its PSA technology. In addition, we also offer complete site installation and commissioning services, along with maintenance and up-gradation service for our range of Gas Separation Systems, Air Filters and Air Dryers. By providing our range of products and services at industry leading prices without compromising on the quality, we aim to achieve undisputed leadership in the concerned domain. Workshops and training sessions are also organized to keep our technicians well versed with the developments in terms of technology and market dynamics. Our exporting countries are Indian Subcontinent, Middle East and Europe.